Commissioner Peter Weldon faced off against Todd Weaver, one of his challengers for Commission Seat #4, before an overflow audience at the Winter Park Chamber this morning. The third candidate for Seat #4, Barbara Chandler, did not participate in the Chamber debate. A good part of the discussion revolved around transportation, traffic and infrastructure. While automobile traffic was certainly an issue, alternative modes of transportation and the need for connectivity also figured prominently. The candidates discussed at length the opportunities for capital improvement and additions to City infrastructure. The candidates offered their views on the state of the Canopy project and on the pros and cons of mixed use development on gateway corridors. One question about the possibility of a medical marijuana dispensary in Winter Park elicited confessions from both candidates that, in the past, they had indeed inhaled. The tenor of the debate was cordial and lively. Both candidates seemed well-informed and thoroughly engaged in the community. Campaigning for office, and the devotion of time required to serve in office, represent a significant level of commitment. Both of these gentlemen deserve our appreciation for their willingness to serve this community. This morning’s debate was the first of four debates that are open to the public. The remaining three are as follows. The Mayflower and Westminster Towers will host private debates, which only residents may attend. 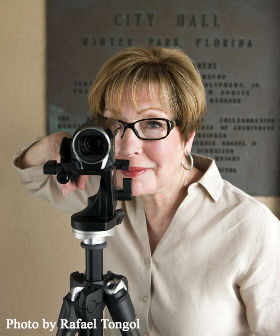 The Winter Park Voice will post video of all four public debates. Those who cannot attend a debate in person can view the video to see which of these candidates you will choose to represent you in Commission Seat #4. Mr. Weaver needs to improve his debate performance, or he’s toast. He did poorly in this initial debate. His supporters were shaking their heads in disbelief when it was over. He has a lot to offer, but he needs to do his homework and get a much better grasp on the facts and issues. Weldon bested him badly this time around. In the interest of equal time, here’s video of Chandler making a speech. If she wins, that would make 5 out of 5 City Commissioners whose career has been either directly working for the government and/or running a business that gets government funding or contracts as its revenue source. How is she any different than the current City Commission? I don’t see any difference. If you want the same old policies, Weldon and Chandler are your candidates. And maybe that’s why now, even after voting has already begun, Chandler has yet to propose even one specific change she would implement if elected. The more things change, the more they stay the same – in Winter Park. Good turnout for her speech. I saw two audience members in video. Nice sound effects. Who do they think they’re kidding? Please fill me in. What did/do the current Commissioners do as far as govt contracts or funding? I’m new to town. The speech is not a hometown local Winter Park campaign speech. It’s crafted more like a presidential speech. This is obviously is a campaign that has had considerable and high level consulting. The other candidates should be ready for anything. Whoever is ultimately behind the facade of this campaign, clearly intends to win the election – but not necessarily with this candidate..
Winter Park has seen its shill candidates before. Shills come in different sizes, ages, genders, etc. But their ultimate objective is always the same: Convince enough people that they are sincere in their intentions for running and are capable of getting a lot of votes (either to win outright or to divert votes that would otherwise go to another candidate). Then, as the strategy says, no one will ever question the official vote count when announced on Election night. Occasionally shills are created for the purposes of fake news and media attention to accelerate social change. The “Families First” theme sounds familiar. What “Families First” means to you and me doesn’t necessarily mean the same thing to them. They can always say that mare density will help families stay close together. And who better than a West Side resident to put a big smiley “Families First” label on gentrification as the bulldozers move through the single family home neighborhood to make way for the high rise apartments and parking garages. The current Commission race is showing some of the disgusting symptoms that have, sadly, infected our national politics. The name calling, fighting over “phantom issues,” and false claims about code violations to smear candidates is truly churlish. Now the Mayor is mass mailing an email thread that wasn’t about him, feigning concern with inappropriate behavior. This isn’t a Mayoral race. Each one of our Commissioners, including the Mayor, holds an independent Seat. And as such, each stands alone. It makes one wonder why the Mayor feels the need to pass along emails (rather like passing notes in grade school) to defend his buddy? Commissioner Sprinkel told everyone at Commissioner Weldon’s kick off party that it was IMPERATIVE that we re-elect Pete. Why is that? What’s wrong with letting the voters decide who they want to see on the Commission, based on the merits of education, ability, experience, skills? Perhaps the current Commission doesn’t have faith in the voters of Winter Park and perhaps feel that we need to be led along to reach the desired result. I, for one, don’t wish to be treated as a child..
Just debate and discuss the issues. Please just leave the playground antics on the playground. Sprinkel’s comment that it is “IMPERATIVE” we re-elect Weldon begs the question, what do she, Leary, and Weldon have up their sleeves now to spring on Winter Park residents? Why would it be “IMPERATIVE” to have the Weldon vote? What would their next egregious “we only need three votes to do it” fiasco be? Rollins buys City Hall…..after it relocates to MLK? Vice Mayor Pete Weldon’s re-election campaign lacks momentum. 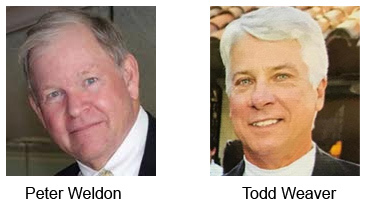 In an off year election – the Seat 4 City Commission race being the only item on this year’s ballot – that means Weldon’s re-election is potentially in jeopardy. Off year elections tend to bring out the disgruntled voters. A quick drive around Winter Park shows the yard sign campaign running about 8 to 1 favoring Weaver over Weldon. In addition, Chandler signs are appearing in a smattering of front yards on several streets, but mostly in the Hannibal Square neighborhood. Informal discussions with residents indicate that the voting, if counted and reported correctly by the government, will go for Weaver by an impressive margin once all the votes are in. Under such overwhelming anti-incumbent sentiment, a Commissioner seeking re-election normally wouldn’t brag about a fellow City Commissioner’s endorsement. But that’s exactly what Weldon did this week on his campaign Facebook page. As I’ve said before, there are only two ways to win an election. And unless someone has found a cunning way to deliver Weldon’s re-election to him without a majority of Winter Park voters casting their ballots for him, there is only one – Weldon needs to find some residents to vote for him – and quickly. There’s not much time left. Since the current commissionere are experienced inthe issues, and have done a good job of protecting our city from irrational changes (except moving the library), now is not the time to bring in a newcomer. Next year maybe. Pete Weldon has been a pragmatic, fair, and straight forward commissioner. Soon after the TV news expose on the City Commission getting in trouble for approving building the new library and events center in violation of State grant provisions, workers were dispatched to MLK Park and hoisted 12 ft high midnight black, triple ply, completely opaque tarps, and wrapped them around a formidable and imposing barbed wire fence, completely surrounding the perimeter of the Civic Center and the gruesome scene of the recent catastrophic tree massacre. The City has not commented if the funds for the cover up of what’s going on behind the Civic Center veil came from Library Bond funds, City Operating Budget, or the Pete Weldon re-election campaign. 1.If the candidate can’t even step out in the open and participate in the process, I can’t fill in the oval next to your name. Ms. Chandler is out for this reason. 3. If a candidate has a super good resume, shows up every day, rolls up his sleeves, shares a positive message, recruits real WP residents to his aid, shows me his donors and they’re my neighbors or friends not LLC’s r PACS, I have an easy choice to make. Weaver is the only person in the race who meets these qualifications. Someone said it to me last week and it rang true. I am pulling the lever for Weaver. When races get close, campaigns play the partisan card. Why? Because they have no choice–they are losing. That won’t fly in Winter Park. If you can’t play by the long-established non-partisan rules, fold your tent and go home. Mr Weldon’s third party flyer is unacceptable. Furthermore, with this tactic, he demonstrates an absolute reluctance to rely on his record–as an incumbent–opportunity lost. But not lost on this voter. My ballot is going in the mail. Weldon will not have a checkbox marked. But Pitt has no problem at all with forcing people who didn’t vote for the $30 million library bond to pay the exhorbitant library bond tax for the next 10 years. And this guy is for Weldon? Maybe Weldon needs another gofer. Referendums on bond issues are decided by majority rule. A neighborhood vote that prevents you from painting your house a different color or installing a decorative fence/door,yard bench is another issue. If you need help discerning the difference, you are definitely not cut out to be a Weldon voter. Pitt does not get it. People decide to buy in places where they will be forced to abide by rules they may or may not like, imposed by persons they may or may not have elected. Think HOA or the Windsong architectural review committee The idea that a bond referendum majority rule is any different from an HP ordinance on the basis of voting percentages is flawed. Weldon decided that no neighborhood majority should be able to decide it’s own destiny but his staunchest supporter has no beef with such a law as to bond refs. Like taking peoples money is any less intrusive than telling them their house can’t be yellow. (Compare Weldon’s thinking on supermajority votes elsewhere.) Weldon used scare tactics in his first run and succeeded in convincing people their property rights were threatened at the hands of municipal government when only residents themselves could have chosen to become a historic district. They still can but Weldon made it much more difficult. What will his bull-oney scare tactic be this time? Property owners have no right to decide whether or not their home or property can or can’t be torn down? it must be a neighborhood decision? That’s a dangerous opinion. Sorta Stalinist. You must be a barrel of laughs to be around. Commissioner Weldon is desperately attempting to secure another term on the Winter Park City Commission. A recent mailer from a political party, financed by dark money coming in sideways, violates the spirit of Winter Parkers’ desire to keep local campaigns local. Weldon needs to stop it and call off the wolves. I don’t believe Commissioner Sprinkel, a registered Democrat, would favor interference in her reelection by big outside money or political parties. I trust Winter Park voters to see through this campaign distortion. I am dismayed at this campaign tactic. Winter Park deserves better. Mr. Weaver’s positive and articulate agenda (environmental stewardship, reasonable dog park maintenance plan), and supporters (very intelligent, well-educated, gracious, respectful, beautifully mannered) are the reason for my vote and support. It was a like a shot in the arm to see, and a delight to meet some of his supporters yesterday on Webster Avenue, next to the University Club. Their understanding of issues of democratic issues of municipal governance is stunning. Their work to preserve Winter Park’s natural, architectural and intangible culture heritage represents the best of traditional American culture and is reminiscent of Jacqueline Kennedy’s struggle to save American cultural heritage, from Lafayette Park to Grand Central Station. The same is true of Winter Park. Mr. Weaver and his supporters have dedicated themselves to raise awareness and save what is left that makes Winter Park special and beautiful – cultural heritage, parks, and a deep sense of community. Confoundedly, a few developers don’t realize they are destroying the special qualities that have drawn people, from residents to tourists, to Winter Park. Many, many thanks to Mr. Weaver and his supporters for all they have done and are doing. And many thanks to BH for the signs. Spreading the word to others to keep reading WP Voice and to keep voting. Pitt Warner is part of the group that is the problem in this town. A town controlled by real estate developers, real estate agents, contractors, real estate lawyers, development professionals, real estate property managers (Mayor Leary), etc. When we change the complexion of our commission to reflect our core values and vision, then we can get our town back to the place where it all started with the Knowles, Rollins, Fairbanks, Morse, Chase, Chapman, and other families. So if you want positive change, vote Todd Weaver on March 12. Mayor Leary and Commissioner Sprinkel should follow the example of Commissioners Carolyn Cooper and Greg Seidel. So far, both are class acts who have not sent emails defending or endorsing any of the candidates. Neither have told me it is “IMPERATIVE”to vote for a candidate. I have to think that anyone inclined to vote for Pete Weldon would change their voting preference immediately after visiting Weldon’s Facebook page. The first thing they see on it is a video of Commissioner Sprinkel endorsing Weldon at one of his campaign meet and greet events. Weaver must be very happy about this. 600 hours till Election Day. Remember, if you’re voting for Weaver go to the polls on March 12. If voting for Weldon or Chandler, vote on the 13th. Thanks for entertaining me this morning! And many thanks to you, Ms. Womble, for important information and engagement at WPV on FB. Your articulate, detailed, clear, positive comments have helped me and many neighbors connect the dots in patterns in WP politics. Many of my neighbors and I voted you when you ran for commissioner in 2014, a year of personal issues for us, or we would have volunteered to help with your campaign. This year we are quietly supporting Todd Weaver. You may not see us at events, but some of us have signs up, and we’re spreading the word on dog walks. On FB, we block surrogates who repeat the same party lines that have lost widespread legitimacy because of the library/park debacle. Longtime Winter Parkers don’t like to see trees clear-cut in our parks. We look for your, Mr. Gottfried’s, and other substantive commenters, as we consider your information and insights as adjuncts to the great reportage at WPV. Posting this as a thank you to you and others like you do to help revive Winter Park as it used to be: a Winter Park which is not afraid of grace and beauty; a Winter Park safe for democracy and diversity of thought; a Winter Park which rewards achievement in the preservation of natural, material and intangible cultural heritage just as it rewards achievement in business. WHAT ABOUT THE RESIDENTS’ DEBATE??? Don’t the residents get to hold a debate for the candidates too, or are the residents completely shut out of the process? Would any candidates attend if the residents moderated a debate for the candidates? Or do the candidates prefer the canned questions they can always count on from their favorite special interest groups? The residents SHOULD be holding EVERY debate. The fact that residents run NONE of the debates speaks volumes about how so many still believe the notation that politics is an honest business that residents don’t need to get any more involved in that writing a check or wearing a T-shirt or planting a yard sign. If residents don’t become involved in EVERY step of the process beginning with candidate selection and ending with verifying that all legal votes are counted and reported accurately, and all the steps in between, they can expect the same results as they’ve always had. Many residents are not retired, have families to take care of,are involved in important activities outside of WP, thus don’t have the time and energy to be involved in EVERY step of the municipal election process. But this is a great idea for those who have the time to organize a municipal political discussion society; the more civic organizations, the better. Furthermore, the focus need not be limited to municipal campaigns. Todd Weaver’s campaign has been so transparent, clear, detailed; we don’t need to hear any debates between him and the other candidates, although we admire Barbara Chandler a lot for her work at Hannibal Square and in the community. However, there is much room for many more discussions on WP politics beyond those held by the local government. In Europe, teen girls are leading the eco-movement. Elders are politically involved in issues across the board, from self-interest (AARP to peace). WP seems ready for another spontaneous movement on behalf of trees, water, participatory democracy, and traditional WP cultural revival. VOTING HAS STARTED! Who Certifies the Votes After City Election?